Machine developed for 3D printing of plastic and ceramic products, with high resolution and in large volumes. 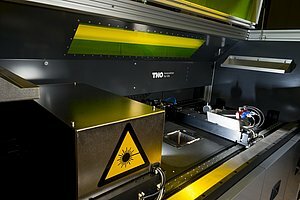 TNO and TU/e will be collaborating on ‘additive manufacturing’. Additive manufacturing concerns methods whereby products are produced layer by layer, such as 3D-printing. TNO and the High Tech Systems Center ofTU/e are starting a knowledge center that is intended to be a leading center for research and development at European level. In contrast to other knowledge centers for additive manufacturing, this new center focuses predominantly on the production equipment for smart, personalized and multi-functional products. Part of the plan is a new TU/e chair and research group. The high-tech equipment will largely target making integrated and smart electronics, customized medical products, printed food, and pharmaceutical and high-tech products. Examples are complete implants, prostheses, dental bridgework, smart electronics like E-pill, smart connectors and integrated LEDs or spare parts for high-tech equipment that can be printed on the spot when needed.